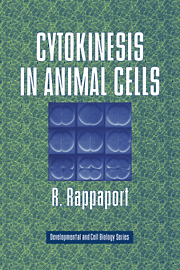 This book traces the history of some of the major ideas in the field and gives an account of our current knowledge of animal cytokinesis. It contains descriptions of division in different kinds of cells and the proposed explanations of the mechanisms underlying the visible events. The author also describes and explains experiments devised to test cell division theories. The forces necessary for cytokinesis now appear to originate from the interaction of linear polymers and motor molecules that have roles in force production, motion and shape change that occur in other phases of the biology of the cell. The localization of the force-producing mechanism to a restricted linear part of the subsurface is caused by the mitotic apparatus, the same cytoskeletal structure that insures orderly mitosis. Preface; 1. Normal cell division; 2. Theories of cell division; 3. The site of the division mechanism; 4. Nature of the division mechanism; 5. Positioning the division mechanism; 6. Formation of the division mechanism; 7. The stimulus-response system; 8. Division mechanism function and its consequences; 9. Informative variations on the normal process; 10. Conclusion; Index.